Choosing the right mattress for your bedroom is tough work. It used to be extremely expensive to purchase a mattress that wasn’t a traditional box spring. But now that there are a range of new entrants to the market, there are plenty of affordable hybrid options available. 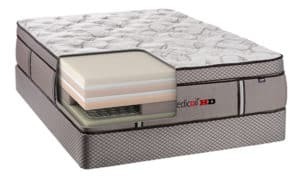 Should I Buy the Therapedic Mattress? While the Therapedic Mattress Collection isn’t as well-known as its competitors, it has a decent range of options available for its customers. In fact, there are three different core options available for purchase. The company was actually started in 1957, but it doesn’t have as much brand recognition as you find with some of the other leading mattress brands. For the purpose of this review, we’ll be taking a closer look at one of the company’s most popular mattresses — their hybrid mattress. There are a few different hybrid mattress options, but the most affordable option is the Bravura — it also happens to be one of the best mattresses on offer from Therapedic. Is the Therapedic Hybrid mattress right for you? Let’s take a look at the core features that you’ll find when you purchase this mattress. The construction of your mattress is the most important aspect of your mattress. The way that it is constructed will determine how it feels and how long it lasts. It’s critical to purchase a mattress that is constructed using the best materials. So, what type of materials and construction methods are used to develop the Therapedic’s Bravura Hybrid mattress? Like most hybrid mattresses, the Bravura Hybrid mattress uses a combination of foam, latex, and coils to ensure that the mattress benefits from a range of different materials. The combination of these materials ensures that the mattress provides comfort, support, and pressure relief for its users. This combination of materials also provides users with excellent breathability benefits. To get a better idea of how this mattress is constructed, we’re going to take a quick look at the layers on offer with the Therapedic Bravura Hybrid. Top Layer — This is the layer that your body will interact with the most, so It’s critical that it prioritizes the comfort you’re looking for. The top layer is made from a thin but practical Energex Foam that provides ample comfort and sinkage for its users. Middle — Talalay Latex makes up the middle layer of this mattress. This provides a transition layer that also adds additional support to the person lying on the mattress. Latex has become a common material for many top mattress products. Third Layer — The last layer of the Therapedic Bravura Hyprid mattress is close to the base layer. This is the laying the provides stability and support you need to sleep comfortably through the night. Without this layer, you’d simply sink to the ground. This layer is made from a foam that has infused coils — these coils provide bounce, support, and breathability. Base Layer — The final base layer is simply a relatively thick, high-density foam that provides that last realm of support for the mattress. Again, this is another layer that is needed to prevent too much sinkage or a lack of support. Edge Layer — Not only does this mattress have three core layers, it also has an edge layer to provide extra edge support to sleepers. This layer is made from micro pocket coils and Quantum Edge coils. These provide additional breathability and support for those who use this mattress. This is an excellent feature that you don’t find in many competitors. When the Bravura first entered the market, it made headlines because of its use of the well-known textile designer Bekaert Deslee. The textile producer is well-known for its knitted zip-covers for a variety of premium mattresses. As you’ll see in the cover of the Bravura, it provides its users with a traditional quilted pattern. The cover provides additional support and protection for the mattress. Fortunately, the cover is quite thin — it doesn’t take away too much from the top layer of the mattress. Some mattress producers aim to provide too much cushion with their top covers, which can result in unwanted heat retention and interference with the natural texture of the cover. At the end of the day, you have to consider the firmness, feel, and support of any mattress that you choose to purchase. If you’re going to spend 1/3 of your life on a mattress, it’s critical to choose an option that has the combination of features that you’re looking for. So, how does the Therapedic Mattress Collection Bravura Hybrid mattress feel? Let’s find out. The Therapedic Mattress Collection Bravura Hybrid is extremely comfortable. It provides a nice hug and contour for the person lying on the mattress. It’s safe to say that this mattress is on the firmer side, when you compare it to other foam mattresses. Still, this doesn’t mean the mattress isn’t comfortable — it’s a medium-firm mattress option. If you’re someone who wants a mattress that has decent resistance without sacrificing too much comfort, this is a decent option. 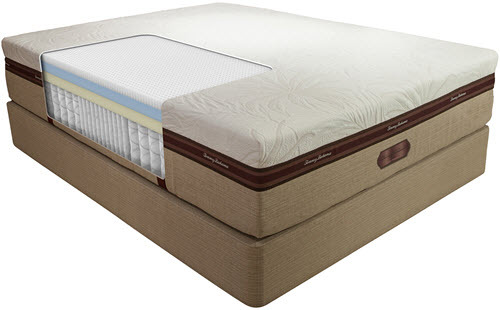 Best of all, the coil system in place helps ensure that the mattress doesn’t lose too much of its bounce. It’s an extremely durable option for those who want a mattress that will last long into the future — you don’t find this benefit with all foam mattresses. Therapedic has had a number of changes over the years. As the company has been in business for over five decades, there have been a variety of different mattress collections released by the firm. As with most mattress companies in the 1950s and 1960s, Therapedic provided traditional coil mattresses for a long period of time. It wasn’t until recent decades that the company has begun to offer other more modern options for its clients. The Bravura Hybrid is one of its most recent additions — there haven’t been many updates to this mattress model. In most cases, Therapedic Mattress will provide new mattress models instead of updates on current models. 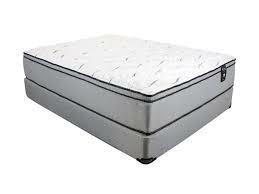 The sinkage in a mattress can determine its suitability for a particular person. If you’re heavy-set, it’s critical not to choose a mattress with too much sinkage — you won’t receive the support you need for a good night’s sleep. The Therapedic Bravura Hybrid is a known as a ‘medium sinkage’ mattress. The coil system and latex layer provide plenty of bounce that prevents too much sinkage from occurring. Still, you should expect a couple inches of contour when you lay on this mattress. This is primarily due to the softness of the top layer of the mattress. If you’re someone who is a bit heavier-built, this mattress is typically a good option. It’s also a decent option for those who enjoy a bit of resistance and don’t want to fall too far into the mattress. As you can see, the Therapedic Bravura Hybrid mattress price points are extremely affordable. Still, there are much cheaper mattress options on the market. If this is out of your price range, don’t worry — take a look at some of the more affordable mattresses we review on this site. Strong warranty — Depending on the type of Bravura you purchase, there is a 10 or 20 years limited warranty attached the product. This can help you protect against manufacturing issues. Trial period — At present, you can test out this mattress for 120 days. Keep your eye on their site for the latest trial period news — it often changes. Made in America — All of these mattresses are made in America, which means you’ll be supporting local workers and businesses when you invest in this mattress! 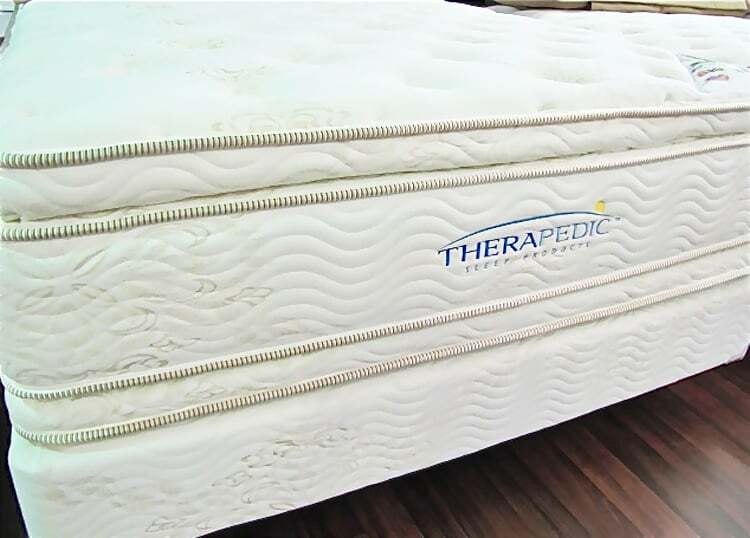 Knowing every person has their set way of sleeping, Therapedic mattresses has taken it to a new level by allowing the buyer to customize and try out the bed of their dreams. Not only can the buyer pick out every detail that goes into their mattress, they can try it in their home for up to 120 days. If the mattress does not meet the customers expectations within that 120 days, they can send it back for a full refund. Today, the internet and making purchases online has upheld the most convenience for the buyer. The purchases of Therapedic mattresses were made to be as easy to buy a mattress online as it is to buy bed sheets and pillow cases online. The buyer picks the type of mattress, the firmness, the comfort level, the mattress topper (such as the memory foam or the gel foam), and the size all online. The prices of the mattresses vary from every option you either add or take off. What is nice about all of the choices, is you can just get a twin size mattress with no add ons or altercations for roughly $330-$650! As a whole, the Therapedic mattresses have not had as many complaints as the other mattress competitors have had! Unfortunately, the small amount of buyers that leave reviews have had a decreasing amount of satisfaction with their Therapedic mattresses. We know and love that these mattress can be purchased online, but when bought and delivered to the buyer’s home, the amount of weight some of these mattresses carry can be excessive. 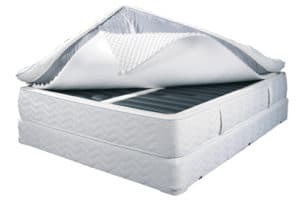 Some of the more expensive mattresses, such as the Hybrid model, that included the mattress toppers can weigh up to 100+ pounds alone. This could be difficult for the buyers that live alone and need to get their mattress in their house and possibly up the stairs. One of the more frequent complaints towards the Therapedic mattress was sagging. As the user slept on the mattress for close to 5 years, they notice a dip starting to form in the middle of the bed. Consumers say even if they were to change the side of the bed they usually sleep on, the sagging would not halt. These mattresses are made with coils which have been said to become more noisy as the years progress. The coils can be induced or reduced based on the buyers wants, but the size of the coils do not make them more or less noisy. Mattresses can not be cleaned as easy as you favorite t-shirt can be, but no mattress buyer expects their mattress to have an odor less than 5 years into having it. Less than 5% of Therapedic mattress buyers have been known to complain about an unusual odor that comes from the mattress. The odor is expected more with the models including memory foam. Temperature during your sleep can determine whether or not you have a good night’s sleep, so if you cannot sleep in hot climates, Therapedic mattresses may not be the top choice for you. No more than 4% of Therapedic mattress buyers say the mattresses can act as a heat trap. The models with the more frequent heat problems include the gel foam topper add on and the soft, pillow top add on. If you can build your own mattress from top to bottom at the touch of your keyboard, and you can have all of these tips to help you accomplish that build, you can create your own sweet dreams! Overall, there are plenty of positives associated with this mattress. It’s hard to see too many faults if you’re in the market for a hybrid mattress. This, coupled with the price point, makes it a mattress that many people consider a good value option. Still, there are a few better options available on the market that have longer trial periods and better warranties. Also, if you’re looking for an extremely soft mattress, this probably isn’t your best option. With so many different options currently available in the mattress industry, it’s critical to consider your options before you make any decisions. 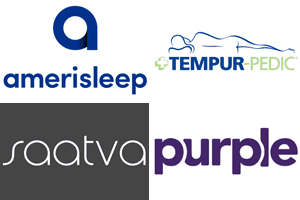 To take a deeper look at some of the other leading mattress brands currently available, make sure to check out some of the other reviews on our site. We cover all the major mattress brands currently available!